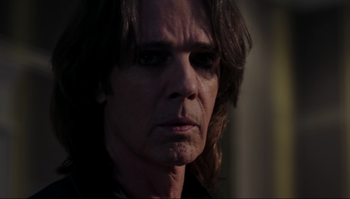 Vince Vincente is an aging rock star, who was mourning the loss of his partner, Jen, when he became a vessel for Lucifer. After a show in Cleveland, Vince heads to his dressing room and pours himself a drink. His drummer, Tommy, urges him to come out with the rest of the band, rather than continue his sulking and drinking alone. He brings up Vince's deceased partner, Jen, and tells him it is time to move on, prompting Vince to sternly tell him to leave. As he sits alone in the dressing room, the lights begin to flicker, and the framed photo of Jen in front of him falls down, startling Vince. An exhausted Vince enters his hotel room, and as he goes to wash his face, unbeknownst to him, the water has turned into blood and as he splashes his face he looks up to see it covered in a crimson mask, shocking him before he realizes it is not real. Alarmed at what is going on he rushes to the next room, where the TV has inexplicably turned on and showing static, and photos of Jen begin floating in the air around him frightening him. All of a sudden, Lucifer appears before Vince in the guise of Jen calling his name. "She" tells Vince she is sorry for killing herself, tapping into Vince's grief and guilt about her death. "She" tells him that "she" is an angel, and that she can take his pain away and give him peace, if he only invites her in. Vince says "yes" and as he is about to kiss "Jen," is consumed in an angelic light. Upon Lucifer vacating Vince's deteriorating meatsuit, Vince's body drops to the floor where it continues to deteriorate due to being burned out from the archangel possession. This page was last edited on 31 March 2019, at 12:13.